I remember when we first got the girls Wii for Christmas a best friend told me, "You have to get Just Dance." I had no idea what it was. After her description, I thought it sounded fun, but didn't know just how fun it would be. My two daughters absolutely love Just Dance! My husband and I enjoy it as well. The Just Dance video series from Ubisoft is a great way to get the entire family in on some fun. No matter the age, anyone can play Just Dance. Just get out there and have fun! I love that the Just Dance games include not only current popular songs, but songs from back in my the day and before. It connects generations. Just as it connects the kids to songs I knew growing up and songs my parents listened to, it also connects me to their music. There is a wide genre of musical tastes, something to please everyone. It gets everyone up and moving and we all have fun singing the songs. And now, here we are, a couple years later with Just Dance, Just Dance 2 and I already heard from Santa that Just Dance 3 will show up in a stocking (heard he got a good buy this summer on it). 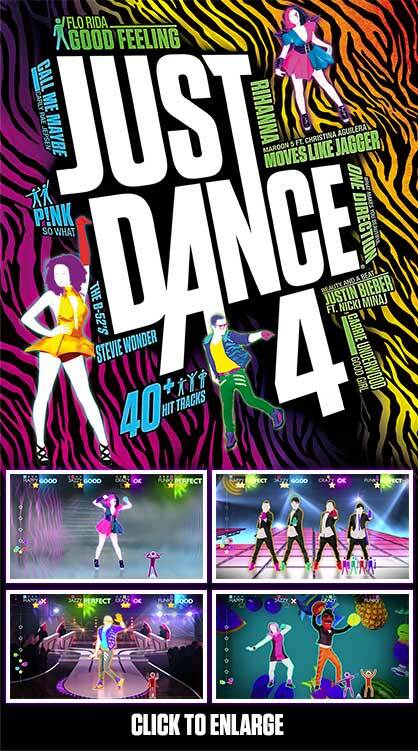 Even more exciting is that Just Dance 4 is on the way, too! My girls are dying to get their hands on JD4--all their friends are asking for it for Christmas. I am excited, too! My girls will hear some great songs by Elvis and They Might be Giants. And with 40 new billboard songs, Just Dance 4 also boasts a new battle mode where you can challenge friends in six rounds of dance battles (bring it on, kids). It also features songs with 4 concurrent dance routines, allowing each player to have his/her own unique moves. The Sweat it Out Mode also got an upgrade. 2 Unlimited – "Tribal Dance"
A.K.A – "Hot For Me"
Anja – "Crazy Little Thing"
Rick Astley – "Never Gonna Give You Up"
Army of Lovers – "Crucified"
The B-52's – "Rock Lobster"
Justin Bieber feat. Nicki Minaj – "Beauty and a Beat"
The Blackout Allstars – "I Like It"
Boys Town Gang – "Can't Take My Eyes Off You"
Blu Cantrell – "Hit 'Em Up Style (Oops!)" Dancing Bros. – "Everybody Needs Somebody To Love"
Kat DeLuna ft. Busta Rhymes – "Run The Show"
Europe – "The Final Countdown"
Flo Rida – "Good Feeling"
The Girly Team – "Oops!... I Did It Again"
Selena Gomez and the Scene – "Love You Like A Love Song"
Halloween Thrills – "Time Warp"
Hit The Electro Beat – "We No Speak Americano"
Las Ketchup – "Asereje (The Ketchup Song)"
Jennifer Lopez ft. Pitbull – "On The Floor"
Marina and The Diamonds – "Oh No!" Maroon 5 ft. Christina Aguilera – "Moves Like Jagger"
Bill Medley & Jennifer Warnes – "(I've Had) The Time of My Life"
Sergio Mendes ft. The Black Eyed Peas – "Mas Que Nada"
Panjabi MC – "Beware Of The Boys (Mundian To Bach Ke)"
Rihanna ft. Jay-Z – "Umbrella"
Skrillex – "Rock N’Roll (Will Take You To The Mountain)"
Will Smith – "Wild Wild West"
Alexandra Stan – "Mr. Saxobeat"
They Might Be Giants – "Istanbul"
But the REALLY BIG NEWS is that Amazon.com is running Just Dance 4 as the Gold Box Deal of the Day TODAY (December 4) for the amazing price of just $22.99! Grab this amazing deal before it is gone! Just get your dancing shoes on and boogie down! What a great deal! My daughter has been asking for this! I absolutely love Just Dance! We have a lot of family game days, which really mean game nights. It is so fun to watch my two nephews and my son (all around the age of 8) strike a serious pose for the Michael Jackson dance off! I can't wait for JD4! Love Just Dance, it really is the perfect rainy day dance around in your PJ's game! Shame on me for missing the deal... My kids love Just Dance and when they can get me to participate it is really fun. The artists on this one make me wanna click right over and buy it right now!